One of the fun things about this blog is that I end up finding cool stuff like this on the back of a discarded pizza box. It’s always great to see good design at play in the most humble, and largely invisible, circumstances. 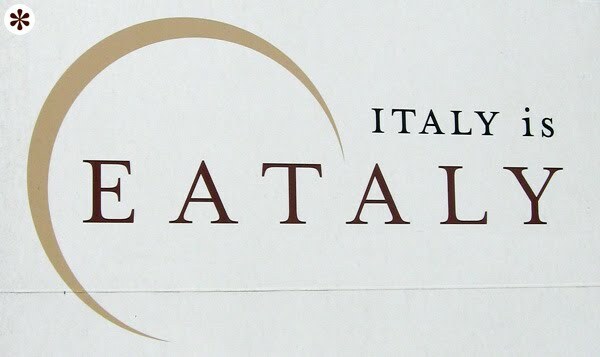 At the other end of the spectrum from humble and invisible is something like Eataly, which is, for those who don’t know, a fancy market and eatery originally founded in Turin, Italy and recently come to NYC’s Flatiron District. It’s a pretty big deal—something akin to when Krispy Kreme first opened a franchise in your town about a decade ago, except with nice wine and cheese. Needless to say, their logo communicates nothing about what makes this place special. In fact, this is one of those far too common occasions when the average customer starts to associate the banal, useless, insulting design of the brand with the quality, luxury experience of the brand. It actually lowers the visual IQ of the public. Grazie, assholes. By the way, your name is stupid, too. Eataly... Do they call their patrons Eatalians?